The Circuit Court of Augusta County has approved Kathy as an ongoing Wedding Officiant for the State of Virginia. Kathy enjoys working with couples to create meaningful ceremonies and personal rituals as they celebrate love and marriage. She finds it an honor to stand as a witness to love and loving commitments. She is willing to travel throughout the state of Virginia to bless marriages. Please contact Kathy to learn more about her services and her fees. Kathy was a wonderful officiant for our daughter's wedding. She helped to guide the couple in planning a very thoughtful and moving ceremony that was reflective of the families involved. Kathy's general approach to life makes her a perfect individual to preside over a wedding. 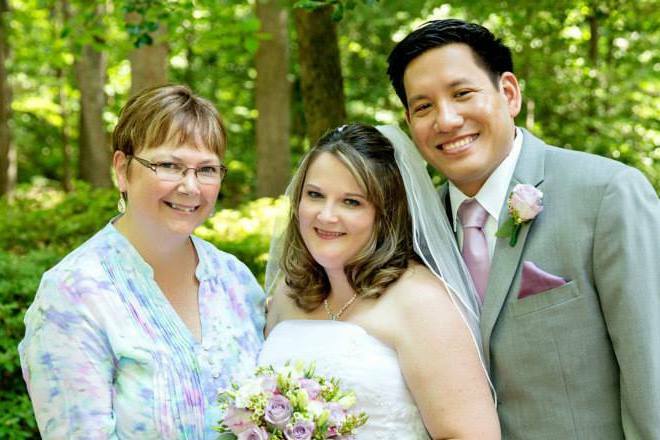 From: Hope and Ron Suzuki who were married by Kathy in 2015:Kathy Guisewite was the officiant for our wedding in 2015 at Unity of Bon Air. Having a spiritual foundation based in the Unity church, it was important to us that our vows represent these beliefs. Through our friendship with Kathy, we already knew she would be a perfect fit for what we were looking for in an officiant. We were unable to find vows already written speciafically for the Unity church so we explained what we were looking for to Kathy and she sent us various materials to look over. From there, we were able to create our very own unique vows. During the process she was present and helpful. She even rewrote some of words from the vows in order for them to accurately express what we needed them to say. Before the ceremony we met to go over the sequence of events and practice our vows. Prior to the wedding day, the rehearsal went smoothly and stayed lighthearted. From: Justin and Lauren Roche who were married by Kathy in 2004. Kathy Guisewite came highly recommended to us by a close friend when we were looking for a marriage officiant in the spring of 2004. For us, it was very important to find someone who was willing to work with our personalities and spiritual beliefs. We had been having a very difficult time finding someone because we were not originally from the area in which we lived, met, and wanted to have our wedding. Upon meeting Kathy, it was almost immediately evident that she had the compassion, broad spiritual knowledge, and genuine respect for the uniqueness of people’s needs. It was an easy choice to have Kathy officiate our wedding in July. Kathy worked diligently and helped prepare ideas for a ceremony that she envisioned fitting our needs. She was flexible throughout the planning process as far as meeting times and made herself readily available. Kathy’s intuitions were spot on because we loved all of her suggestions and her vision. This helped us tremendously and relieved a lot of possible stress; the words to be spoken at our wedding were going to be, and are, the most important part of our marriage ceremony. As we got to know Kathy throughout this process, we became increasingly fond of her easygoing and loving personality. By the time our rehearsal and wedding days arrived, we felt extremely comfortable with Kathy; she has a way of easing stress and nervousness just with her presence. Our ceremony couldn’t have been more perfect; we feel very thankful to have found Kathy through simple word of mouth and having ended up with such an amazing wedding. We liked Kathy so much, that we have continued to stay in touch to this day and feel that any couple would be fortunate and lucky to be married by her.